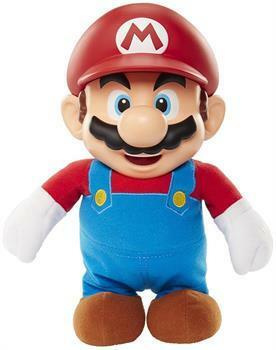 New from the World of Nintendo toy line is Goomba Stompin Mario, a soft feature plush version of your favorite Nintendo character that comes to life! With 5 iconic Super Mario game sequences pre-programmed in Mario will jump in time to the music and sounds straight from the game. Figure measures approximately 10 inches tall. 4 AAA batteries required (included). New from the World of Nintendo toy line is Goomba Stompin Mario, a soft feature plush version of your favorite Nintendo character that comes to life! Figure stands approximately 10 inches tall. 5 iconic Super Mario game sequences! Mario will jump in time to the music and sounds straight from the game!